Summary: After Sam’s family is asleep, she slips outside for some nighttime feline adventures. Maps are used to enhance her journey: a map of her route, a map showing what Sam looks like inside; a map of what’s under the pond she visits, as well as one of a molecule of water in the pond. As Sam ponders the night sky, there are maps of the larger world and universe: the earth, the planets, and constellations. 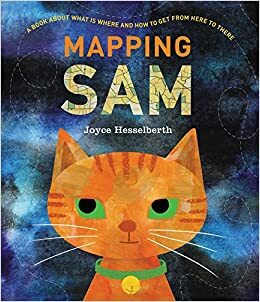 Finally Sam heads back inside to join her family in sleep and dreams, and the author concludes with the question, “Can you map a dream? You might try.” Includes additional information about each map shown in the book. 40 pages; ages 4-8. Pros: A clever and engaging introduction to maps. The author defines a map as “a picture, usually on a flat surface, that shows what is where and how to get from here to there”, and this broad definition allows her to show how maps are useful in many different areas of life. Cons: It would have been helpful to have that definition at the beginning rather than the end. I found myself thinking, “That’s not a map!” as I read the book until it became clear on the last page. I, too, like that definition. And I’m with you on the Con.